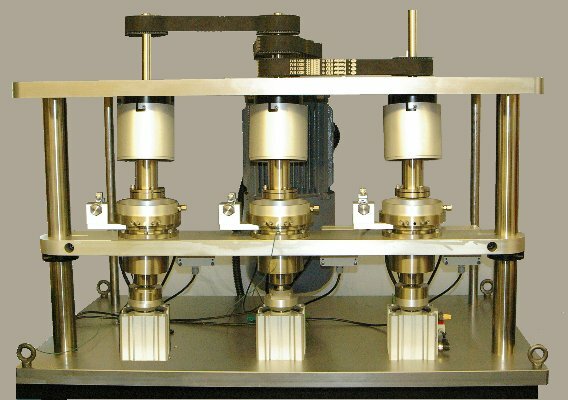 TE 94 Multi Station Rotary Tribometer is a three station test machine specifically designed to run multiple tests in the thrust washer and three pin on disc test configurations under identical test conditions. 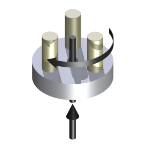 Sensors may be provided for on-line measurement of friction, wear displacement (by capacitance probe) and sample temperature. 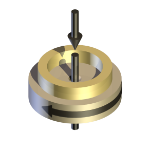 The incorporation of a linear air bushing in the loading and friction torque assembly allows precise control of the load in the range control of load, range 20 to 2,000 N and corresponding precision in the measurement of friction torque. Load is applied to each test station by means of pneumatic cylinders, with the same air pressure applied to each cylinder. One cylinder is designated as master and is fitted with a force transducer to measure the resulting specimen load. Pressure to the cylinders is manually controlled by means of a precision pressure regulator. Alternatively, automatic control can be implemented using an optional servo pneumatic control valve. The control system includes the SLIM 2000 Serial Link Interface Module and COMPEND 2000 Windows based control and data acquisition software. The automatic control of load (optional), speed, temperature and test duration, combined with flexible data logging and alarm level checking, greatly facilitates use of the TE 94 for routine product screening. Test may be run in accordance with the guidelines laid out in ASTM G99 Wear Testing with a Pin-on-Disc Apparatus and ASTM D3702 Standard Test Method for Wear Rate of Materials in Self-Lubricated Rubbing Contact Using a Thrust Washer Testing Machine.